Misuse of prescription drugs is an all too common headline in this year’s news. We hear about celebrities struggling with addiction, and we see communities ravaged by the effects of dependence on painkillers. What we can easily overlook, however, is the reality that teens are not exempt from the reaches of prescription drug abuse. Parents are almost always shocked to discover that their missing medication is a result of their own child stealing the medication. Sometimes they don't realize it until a crisis unfolds. That is generally when admission counselors at Elk River Treatment Program hear from parents the first time. After marijuana and alcohol, prescription drugs are the most commonly abused substances by teens in the United States. Though teenage prescription drug abuse statistics may vary by region, rates have more than doubled in the past ten years. In 2015, an estimated 18% of high school seniors reported having misused prescription drugs at least once, and 13% acknowledged misuse in the past year. 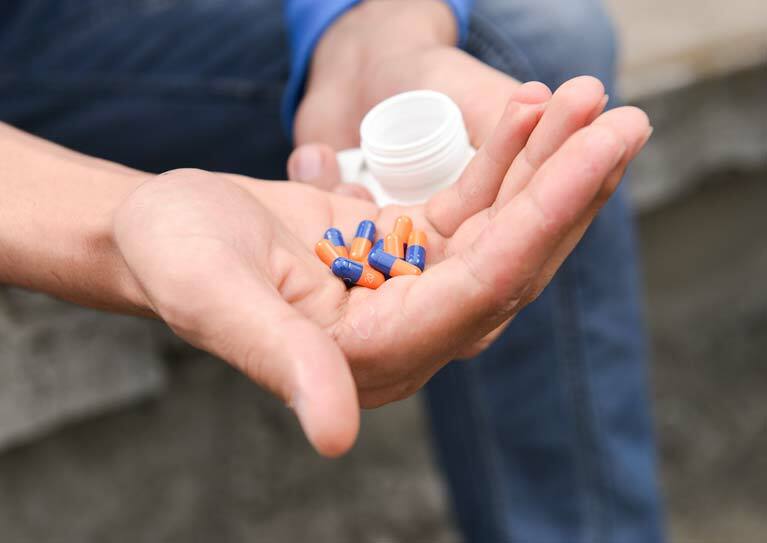 Because sharing or lending prescription medication has become so common and casual in many communities, teens may not understand the risks of the behavior. "They assume that because it’s a prescribed medication, the dangers are not as great as illegal drug use," according to Elk River's Admission Director Kathy DeMellier. "They also might not realize that taking their own medication in a different way than prescribed, such as increasing the dosage or crushing a pill and snorting it, is considered abuse," Ms. DeMellier said. The reasons for prescription drug abuse in teenagers are as diverse as the teens themselves. They might feel the social pressure to take a risk, or they might feel stressed with life’s challenges. "Some begin by experimenting while others want to escape and get high. Others may think they can get better grades or lose weight quickly. No matter why or when they start, the risk of dependence, addiction or even death is real," Ms. DeMellier said. A comprehensive treatment program will look below the surface of behaviors to reveal the source, she said. Elk River Treatment Program is much more than a drug and alcohol treatment program. "We are treating the whole child, the whole family - not just the symptoms of drug abuse," DeMellier said. Opioids (painkillers) – This class of drugs includes medications such as oxycodone (Oxycontin) and hydrocodone (Vicodin). If a teen is abusing painkillers, you might notice symptoms such as slowed breathing, poor coordination, sweating, confusion, and depression. Users may crush the pills to achieve a stronger effect, which can slow breathing, lower blood pressure, and even lead to a coma. Stimulants – This class of drugs often includes medications used to treat ADHD, such as Ritalin or Adderall. If a person is using stimulants, they might have a high body temperature and a fast heart beat. They also put themselves at risk for heart problems, seizures, and feelings of paranoia. Sedatives – Teens often abuse anti-anxiety medications, such as Xanax, or sedatives used to treat sleep disorders, such as Ambien. Misuse can cause lack of coordination, slurred speech, memory loss, slower breathing, and disorientation. People who misuse sedatives are also at risk for overdose and death. In addition to the physical signs, behavioral changes can also indicate your teen may be abusing prescription medication. Some of these behaviors might include sudden shifts in mood or personality, changes in appetite or sleep habits, and lack of interest in activities they once enjoyed. "Parents must educate themselves on the signs of abuse which includes a child that is too happy. The early effects of opioid abuse include a feeling of euphoria," one mother said. "My son described it as feeling like Superman. Like he could do anything. It's exhausting to question every high or low that your child exhibits, but opioid abuse is very difficult to spot early on," she said. She advises parents to pay close attention to their child's extreme mood swings, lock up medication including cough syrup and cold medicine, and pay close attention to cash and household items. "No one wants to believe that their child would steal from them, but when drugs take over, their brains are not functioning properly," she said. Her son struggled with opioid addiction for several years but now enjoys a sober life at age 25. It has taken more than one period of treatment after the first intervention that introduced the family to Elk River Treatment Program. "You must understand that addiction is a life-long battle and lapses and relapses are a part of recovery. Expect that follow up treatment may be necessary. Come to terms with the fact that a slip is not the end of the world. You want them to come to you for help before a slide becomes a full blown relapse. There is always hope if your child is still breathing," she said. How Can I Help My Teen Today? Promote awareness – You don’t know what your teenager knows about prescription drugs until you ask them. If they do take prescription drugs, teach them how to take the medication properly and advise them never to give or sell the drugs to friends. Rather than lecturing, you can point out recent news stories about prescription drug abuse and the larger societal consequences of addiction. Empower them – There are many ways to refuse a friend that asks you to share prescription drugs. Prepare your child for such scenarios in advance. Model good practice - Model healthy behaviors by taking your own medication correctly, keeping track of pills, and not borrowing medication within your family. You can also teach teenagers how to talk to their doctor and ask good questions. Ask for help – Recruit your family doctor or a mental health professional to talk with your teen about the dangers of prescription drug use. If you think your teen is already misusing medication, mental health professionals can provide screening or immediate intervention to licensed residential programs like Elk River Treatment Program for teens. Support groups are also available and can be found by searching AA, NA, Al-Anon or Nar-Anon groups in your area. Family physicians, mental health professionals and school counselor can often provide vital information about detox, as side effects can be quite serious. If you’re not sure where to start, then begin in your own house. Are your medications kept in a safe place? Are old medications discarded? Do you keep track of medications to make sure your teen or visitors are not taking them? And above all, do you model appropriate behavior with prescribed medication for your child? When prescription drugs are taken seriously at home, your teen will carry that responsibility out in the world.